Dnyanesh Deshpande | Green Space Alliance | Urban designers | Planners | Landscape Architects. GSA’s founding principal Dnyanesh Deshpande has extensive public as well as private sector experience in Canadian and international projects involving master planning, campus planning, architectural controls and policy planning. His diverse experience and passion for planning afford him a unique understanding of all aspects of urban development, from architecture to urban design to land use policy planning. 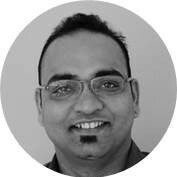 Over the years Dnyanesh has worked on a wide range of projects all over Canada including Ontario, Manitoba, Saskatchewan and Alberta. In recent years, he has worked on a number of large scale urban revitalization projects in Edmonton area including the Capital City Downtown Plan, the Quarters Redevelopment, the McCauley Neighbourhood Revitalization and Jasper Place Transit Oriented Development. He also holds an equally strong portfolio of working with rural municipalities in western Canada providing policy planning solutions. He has a comprehensive understanding of municipal approval processes involving rezoning, subdivision and Area Structure Plan applications, particularly in the Canadian context. Dnyanesh holds Bachelor of Architecture from Pune University, Master of Urban Design from Centre for Environmental Planning and Technology, Ahmedabad and Master of Urban Planning from McGill University, Montreal. Dnyanesh has also served as Principal Urban Designer for the City of Edmonton from 2006 to 2010.